Wästberg gained immediate attention and recognition when the company’s first collection was launched in 2008. 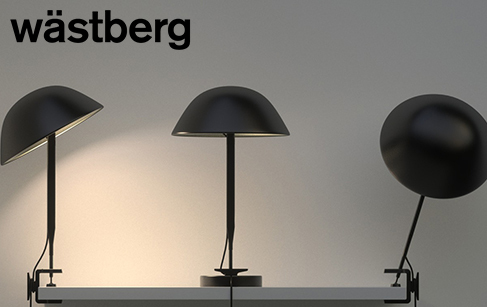 The company’s founder, Magnus Wästberg, was born into the lighting trade and had through experience gained an understanding for the need to fuse aesthetic sensibility with Swedish engineering mentality. In close collaboration with some of the most renowned architects and designers in the World, including David Chipperfield, Claesson Koivisto Rune, Ilse Crawford, James Irvine, Jonas Lindvall, Jean-Marie Massaud, Nendo, Inga Sempé and Dirk Winkel, Wästberg’s ideas have been turned into succesful products. The lamps have been honoured with more than 50 awards for design excellence, including 8 Good Design Awards, 5 Reddot awards, Design Award of the Federal Republic of Germany, Elle Interior Design Prize, the Swedish Design Award, Wallpaper Design Award and Design of the Year. Wästberg is based in Helsingborg, in the southernmost region of Sweden, Skåne.